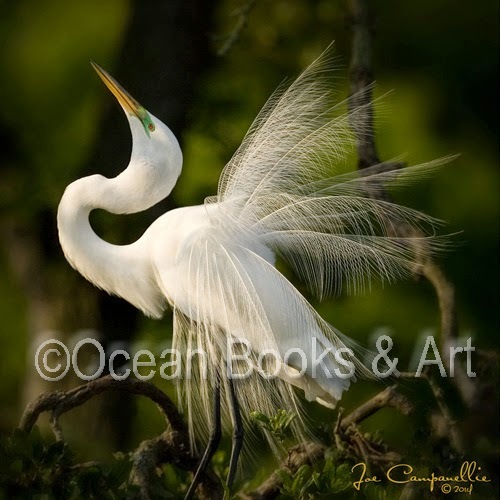 Ocean Books and Art is pleased to present photographic artist Joe Campanellie’s images in our Gallery. We are currently offering several of Joe’s images at a price reduction for a limited time. If you are interested, or know of anyone who may be, please contact me. Feel free to forward this email to others in your circles. Joe will be presenting a program, “The Art of Nature Photography,” on Thursday evening, June 5th, from 6-7 p.m. here at Ocean Books & Art, 200 S. Oceanshore Blvd, Flagler Beach. The program is free. Seating is limited, so please reserve your place at 386-693-4882 or email me at publisher@oceanpublishing.org. Joe will reveal some of the stories behind the creation of his award winning images. He will discuss the technical and creative techniques he uses to create some of the most amazing avian and wildlife images in the industry today. After running a photography studio in Maryland for 30 years, he and his wife, Mary Jean, relocated to Palm Coast recently to pursue his new found passion of wildlife photography. The Smokey Mountains, bald eagles of Alaska, beautiful American scenic landscapes, and especially the migratory birds of Florida, have become his favorite subjects. Campanellie’s images exhibited at Ocean Books & Art in Flagler Beach began as an exercise to re-kindle his lost passion in photography. But it became so much more to him personally, professionally, and creatively. What began as a series of self-assignments to avoid creative burnout became a body of work that defines him as the photographer he is today. Joe received the Master of Photography Degree in 1996 and the Photographic Craftsman Degree in 1998 from the Professional Photographers of America. In 2010 he was awarded the prestigious Fellowship Degree from the American Society of Photographers. Since its inception over 40 years ago, there have only been 107 photographers worldwide to have completed the thesis and portfolio requirements for this highly honored degree. Joe's images have won critical acclaim from such respected organizations as Eastman Kodak, the Fuji Film Corp., the Professional Photographers of America and the American Society of Photographers. His images have been displayed nationally at the Photographer’s International Hall of Fame in Oklahoma City, the Epcot Exhibit in Orlando, Florida, Dulles Airport in Virginia, and internationally through the Professional Photographers of America’s International Loan Collection. His images have been accepted into many juried art shows throughout the United States, and are displayed in private and corporate collections. Both he and Mary Jean maintain active speaking and judging schedules addressing professional photography organizations, photography schools, seminars, and workshops throughout the country. I look forward to seeing you in our Gallery to consider the purchase of Joe’s work at this special offering and for his program on Thursday, June 5th.